The value of a Confederation - 3 cents 1917 stamp depends on several factors such as quality and wear, supply and demand, rarity, finish and more. Values in the section are based on the market, trends, auctions and recognized books, publications and catalogs. This section also includes information on errors and varieties and characteristics. Despite the effort put forth by Canada during the First World War, the 50th anniversary of Confederation on July 1, 1867, did not pass unnoticed in 1917. As part of the program adopted for the occasion, the Dominion Cabinet approved on June 13, the issuance of a special 3-cent stamp to commemorate the anniversary. "The Fathers of Confederation" from a photograph of the original oil painting by Robert Harris, C.M.G., R.C.A., formerly in the Railway Committee Room of the Centre Block, Parliament Building, Ottawa. It was destroyed by fire on February 3, 1916. The painting is not shown in its entirety. Eight members of the group of the original work were omitted from the stamp for reasons of space and balance in design. 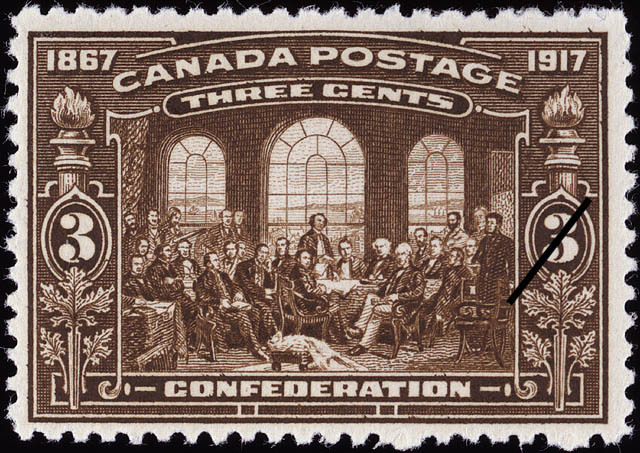 The omission was rectified when the subject was again used for the 2-cent stamp of the Confederation issue of 1927. The view through the windows is of the scenery and shipping on the St. Lawrence River from the old Parliament Buildings at Quebec. In the middle foreground the items are two maps rolled under a stool. A light overcoat lying on it serves as an effective composition. Robert Harris, "The Fathers of Confederation"